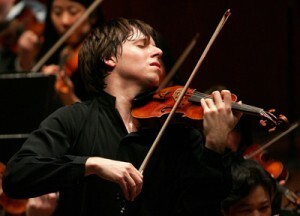 Violinist Joshua Bell, former student of SAW Director Mimi Zweig and acclaimed as “one of the most exciting-and authentic-violin talents to emerge in many years” (The Strad), will perform in the Pabst Theater on Sunday, February 23, 1992, at 7:00 PM. Though only 24 years old, Mr. Bell is in demand as a recitalist and chamber musician, and a soloist with major orchestras worldwide. He studied at Indiana University with Mimi Zweig (founder and director of the String Academy of Wisconsin) and distinguished violin pedagogue Josef Gingold. Mr. Bell made his debut with the Philadelphia Orchestra at the age of 14. In 1987 he became the first violinist in 10 years to be signed exclusively by London/Decca Records. Mr. Bell will perform in this concert with pianist Andrew DeGrado, Assistant Professor of Music at the University of Illinois at Champagne/Urbana, and members of the String Academy Chamber Orchestra. Mr. Bell and Mr. DeGrado have performed together several times on the Johnny Carson Show. The program will begin with Rondo Brilliante by Schubert, and Sonata in D Minor by Brahms. After intermission, Mr. Bell will perform “Winter” from The Four Seasons by Vivaldi, accompanied by members of the String Academy Chamber Orchestra. The recital will conclude with Recitative and Scherzo by Kreisler, Melodie by Tchaikovsky, and Variations on an Original Theme by Wieniawski. Tickets are $10 and $30 and may be purchased by calling the Pabst Theater box office (278-3663). Proceeds from the concert will be used to establish an endowment fund to help ensure the future of the String Academy. Donators of $500 to the String Academy before Feb 20 will receive a $30 ticket, an autographed Joshua Bell CD recording, and be invited to join Mr. Bell for dinner at Ms. Zweig’s home after the concert.